Magnesium deficiency is widespread and many do not realize they may have one. Magnesium is the single most important nutrient for health – it is a key critical nutrient for over 300 different chemical processes in the human body. Magnesium helps maintain normal nerve and muscle function, keeps our blood pumping effectively and ensures healthy and strong bones among numerous other roles. Why is Magnesium Deficiency So Pervasive? Our soil has become extremely depleted of nutrients and the plants that grow in the soil have very little uptake. The meat we eat contains a negligible amount as the animals that feed on the plants have a decreased intake of magnesium as well. Diet and supplementation are key to optimizing a magnesium deficiency. If supplementing, it is important to choose the right variety. The best bio-available form of magnesium is magnesium citrate or magnesium chelate. Consider supplementation or a diet high in magnesium-rich foods. Without this crucial mineral, your body simply cannot function optimally. In a small bowl, combine the dressing ingredients, except for the cilantro. Use a tad more water as needed to thin. If dressing is too thin, add more tahini. Once blended to your liking, taste for flavor, stir in cilantro and set aside. Steam your broccoli just until al dente and bright green using a bamboo steamer, double broiler or preferred method. 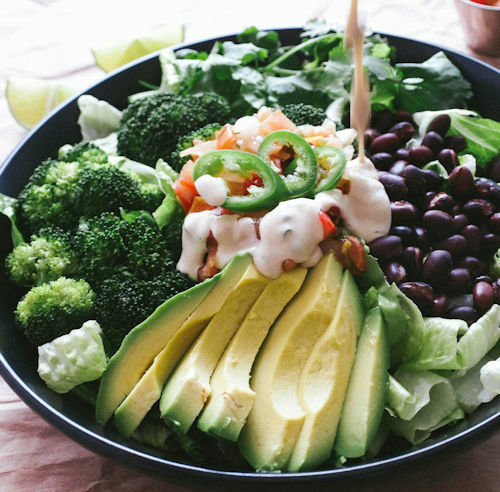 Add romaine to your serving dishes, top with black beans, broccoli, avocado, pico de gallo, a few sprigs cilantro and slices of chili peppers. Top with dressing and enjoy! Walker, A. F., Marakis, G., Christie, S. & Byng, M. Mg citrate found more bioavailable than other Mg preparations in a randomized, double-blind study. Magnesium research : official organ of the International Society for the Development of Research on Magnesium 16, 183-191 (2003).